If your web site has Google Analytics installed, you are able to see a whole lot of valuable information about the people who are visiting the site; where they come from, how they found you, and more. If you don’t have analytics, it’s pretty easy to add on, and is a FREE service. One of the analytics reports that my clients are familiar with is the Channels report, which divides the visits to the site (user sessions) into major categories: Organic Search, Direct Traffic, Referrals, Paid Traffic, Social Media, Email and more. To see definitions of these Channel categories, you can click here. 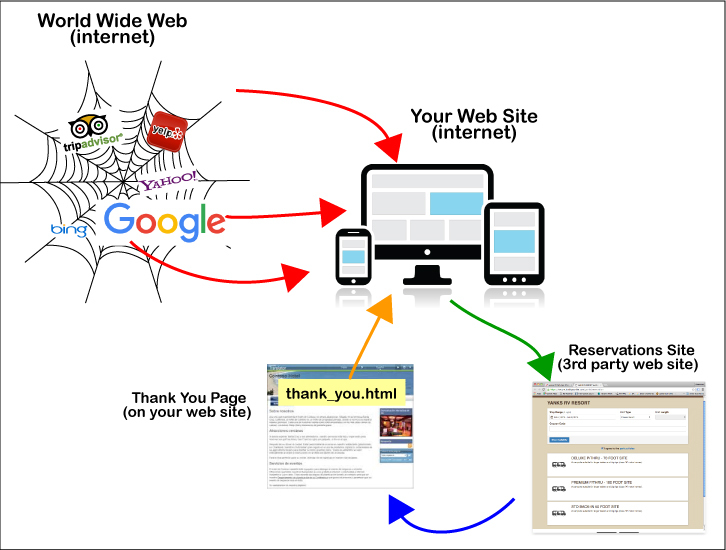 Direct Traffic is from web visits that come directly to your site; the visitor didn’t come from Google or from a link on another web site. They saw your web address in an ad or brochure. They arrived directly at your web site using the exact web address like www.example.com. In general, we want to set up Google Analytics reports to be as accurate as possible. One source of data error comes when a customer visits your web site, then books a reservation, and is then returned to your web site. (See the illustration below). If you have online reservations software embedded on your web site, the process can create a Direct Traffic measurement error. When consumers click the “Reserve Now” button then are taken to a separate reservations management system to do the booking: select a date, pick a camping site type, then complete the purchase and pay by credit card. After a successful reservations transaction, the customer is linked back to your web site and are served a ‘thank-you.html’ page that confirms the reservation is complete. The reservations provider’s site is called a ‘3rd party web site’. So technically the customer came to your site, was re-directed to a 3rd party, then came back to your site. Strait Answers has a simple solution: filter out the visits from the reservations 3rd party web site from within Analytics. We do this by creating a segment filter that includes only traffic from your host (Hostname). So it shows the visits to the web site, but not returning visitors who made a purchase on the reservations site. David Strait, the RV Park Marketing Guy, has developed a method that shows traffic to the main web site, AND a second report that shows the behaviors and demographics of ONLY your customers who booked online. That way the Direct and Organic traffic counts are accurate. If you’d like to get more details on how to set up this kind of segment filter in analytics, call David. He loves to chat about Google Analytics. Call us at (925) 753-1040 or use the form on the Contact page to send an email with your question.